A fine spectacle is offered by the vilage of Astypalea or Hora, beginning from the islets the traveller can admire before reaching the picturesque bay of the city. The wharf is at the south-east extremity. The beauty of Hora is accented by its white houses surrounding the walls of the Byzantine fortress, on the top of the hill, and descending, so to speak, the slope till the seashore. Being part of the scenery, the old mills on the height complete the imposing panorama. Within the area of the Castle fallen in ruins, where still remain, as the only mark of the Guerinis' rule, their blazons, we come across two churches: the older one of St George and the modern one of the Annunciation. The Church of Panaghia Portaitissa or of the Castle, just at the foot of the Castle, is one of the finest in the Dodecanese. It was built by the holy man Anthimos the Blind in 1764 with the assistance of the old priest Michael. The altar screen carved in wood and overlapped with gold-foil is one of the most beautiful of the kind. The icon of Virgin Mary is a faithful reproduction of Panaghia Portaitissa of the Convent of Ibers on the Mount Athos. It was the holy man himself who brought it from Mount Athos. The Church holds its feast on the 15th of August. On that day popular rejoicings take place. Skala – You can moor on the ferry quay but you might be asked to move for a short time when the ferry is due. You can also anchor in the bay. The bay is fairly sheltered except to SE winds which in this case anchor in Maltezana. Facilities include water and fuel. Provisioning can be obtained in the village. Maltezana – An attractive bay with good shelter from the meltemi. Some care must be taken as there are reefs in the passage. Please consult your pilots book. There are a few tavern and cafes and some limited provisioning can be obtained. Ormos Agrilithi - This is a deserted wild inlet. It provides good shelter from the Meltemi. Caution must be taken while entering there is a shallow patch (4-5 meters) lying approximately ½ a mile SE of the E entrance . This bay is ideal for a afternoon swim. 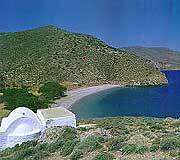 Ormos Livadhi - The large bay of Livadhi is located on the south side of the Chora where you can anchor at the head of the beach. Fairly well protected from the meltemi.